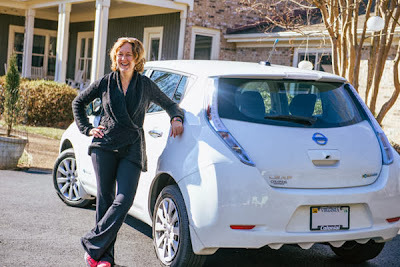 Amy Eichenberger of Charlottesville, Va., became the 99,999th global Nissan LEAF customer when she purchased her 100 percent electric vehicle at Colonial Nissan. Amy, a 47-year-old mother of two, wasn't even in the market for a new car. Then she spotted a University of Virginia colleague's Nissan LEAF and decided she wanted to know more about the "modern-looking, futuristic and progressive" car. "As an architect, the style first got my attention, and I loved the concept of zero emissions," Amy said. Amy is a project manager overseeing major capital investments for the University of Virginia in Charlottesville. Nissan LEAF was the first car Amy test drove, and she loved the zip it had. A Mercedes driver for 10 years, Amy describes herself as "picky." Quality, safety, a "glide ride" and reliability were at the top of Amy's auto shopping list criteria. She said she had a few initial reservations—primarily around range—so she tested out some gasoline and diesel competitors as well. "I'd been told once I drove a Mercedes I'd never drive anything else again. I don't need fancy, but I do appreciate the solid feel and craftsmanship of a luxury vehicle, and I get that in the LEAF," Amy said. "The general fuel economy out there is unimpressive and many of them felt tin-canny. I didn't even want to look at anything in the 20 MPG range. I considered the VW Jetta TDI, Toyota Prius, Honda CRV and a couple of Subaru wagons, and I always came back to the Nissan LEAF. Everything else seemed stuck in the past," Amy explained. Amy ultimately chose a LEAF S in Glacier White. Her commute is about 10 miles to the university each day and most of her errand-running is around the city—well under the LEAF's estimated range of 84 miles on a full charge. "I have friends I like to visit in Richmond, which I can do in the LEAF with some planning, and in DC, which I'll do in my son's or boyfriend's car. LEAF will meet my needs 98 percent of the time, and I didn't want to let a little range anxiety prevent me from missing out on what I consider a much more progressive and forward-thinking vehicle than any of the alternatives." Chris Crowley, the dedicated EV salesperson for Colonial Nissan, sold Amy her LEAF. He explained that LEAF buyers are not typical walk-ins. "LEAF buyers generally come in well educated about the vehicle, looking for even more information and wanting to see how it feels and drives. We spend a lot of time talking about driving habits to make sure it meets their needs and reviewing how very much it's like any other vehicle in its capabilities with the added benefit of no fuel bill. Folks like to be green, but you can talk to their pocket books as well," Chris said. Chris has been with Colonial Nissan for two years and has been the lead EV person for most of that time. He's sold nine LEAFs total with three of those coming in the past three weeks. "LEAF sales have picked up because once we were selling to engineers who were fans of the car and knew exactly how it worked. Now we're selling to a much broader audience, and I think we've benefitted from a few folks who resolved to be greener in the new year." Nissan LEAF launched in the United States in December 2010. The United States accounts for nearly half of the sales worldwide. The pace of LEAF sales has continued to accelerate. In 2013, Nissan sold 22,610 of the electric vehicles in the United States, more than twice as many as in 2012 and more than 2012 and 2011 Leaf sales combined. Nissan LEAF traditionally has performed well on the West Coast with notable markets such as San Francisco, Los Angeles and Seattle, but now interest has expanded across the country. New hot markets have emerged such as Atlanta, which has been the No. 1 LEAF market for the past five months. "With LEAF, we see a high level of organic growth and viral sales where LEAF owners become our best evangelists and salespeople. With electric vehicles, many folks presume a 100 percent electric vehicle won't meet their needs until they chat with a neighbor, co-worker or family friend who loves their LEAF and explain its practicality, and then it goes on their consideration list," said Erik Gottfried, Nissan's director of EV Sales and Marketing. "In fact, we're seeing similar results with the geographic dispersion of sales. With sales high in Atlanta, we now see other Georgia markets such as Macon and Columbus picking up significant momentum, similar to Eugene, Ore., following on the success of Portland." Nissan LEAF is best-selling EV in history with 48 percent market share of the electric vehicle market globally. As of November 2013, Nissan LEAF drivers have completed an estimated 1 billion zero-emission kilometers, resulting in approximately 165 million kilograms of CO2 saved. Nissan LEAF offers powerful acceleration, quiet operation, energy efficiency and low cost of maintenance. Nissan has extended the standard warranty for the battery-power holding capacity with its own additional warranty for customer satisfaction and assurance. After leading the era of electrification in passenger vehicles with the LEAF, in 2014 Nissan will become the first to bring a mass-market all-electric light commercial vehicle to market. The e-NV200 will go on sale in Europe and Japan bringing the benefits of quiet, cost-efficient, zero-emissions mobility to businesses. In June 2014, Nissan will participate in the 24 Hours of Le Mans with the NISSAN ZEOD RC and aims to set a record for the fastest all-electric, zero-emissions lap of the circuit. Nissan is committed to using the EV platform to break new ground in both the commercial-vehicle and motorsports arenas.